According to the latest bi-annual report from network testing firm RootMetrics, Verizon Wireless (NYSE: VZ) continued to lead in overall performance with AT&T Mobility (NYSE: T) not far behind. However, thanks to improvements Sprint (NYSE: S) made in fixing blocked calls and texting reliability, Sprint leapfrogged back over T-Mobile US (NYSE:TMUS) for third place overall. In RootMetrics’ report for the first half of 2014, T-Mobile overtook Sprint for the No. 3 spot. The latest report from RootMetrics looks at how the Tier 1 carriers performed in the second half of 2014. Some carriers have used RootMetrics’ reports to brag about their network strengths and improvements. However, T-Mobile CEO John Legere has said data collected by firms like RootMetrics don’t keep up with T-Mobile’s pace of network improvements. In an interview with FierceWireless, RootMetrics CEO Bill Moore defended the reports his firm produces as the most accurate, comprehensive and independent in terms of third-party measurement of carriers’ networks. He also noted that the company produces reports “almost” on a daily basis. RootMetrics studies the top 125 U.S. metro areas and the top 50 airports and puts out reports on all of those twice per year, adding up to 350 reports. In terms of overall national performance, Verizon came in first with a weighted score of 93.5 (on a scale of 100), AT&T came in second at 91.3, Sprint finished third at 86.3 and T-Mobile finished fourth with a score of 83.5. 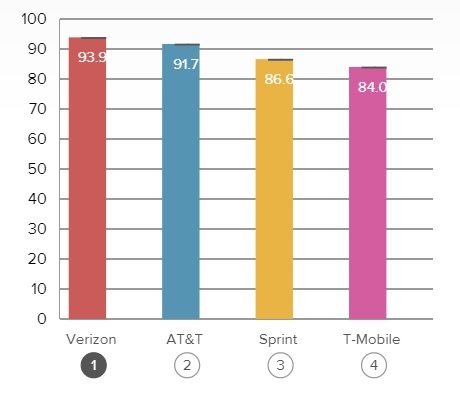 RootMetrics found Verizon Wireless in the lead in its overall scores for the second half of 2014. While T-Mobile finished fourth in the overall national “RootScore,” its strong data network and speed performances helped it top Sprint to finish third in those categories. While T-Mobile offered strong performance in major urban areas, the national RootScore award also takes into consideration performance outside of large metro areas, where T-Mobile still has room for improvement, RootMetrics said. T-Mobile has been steadily expanding its LTE coverage, which now covers 265 million POPs. However, T-Mobile has pledged to deploy LTE on its 700 MHz A Block spectrum and 1900 MHz spectrum this year to hit 285 million POPs by mid-year and 300 million by year-end. Verizon and AT&T both cover more than 300 million POPs with their LTE networks; Sprint now covers 270 million POPs. “We are seeing significant improvements by all [carriers],” Moore said. Although Verizon swept in the awards for national overall performance, reliability and speed categories as well as data and call performance, it slipped to third in texting performance. AT&T was a close second in all of those categories and won the overall texting performance award. Sprint jumped ahead of T-Mobile mainly due to improvements in its calling and texting performance. T-Mobile saw significant improvements from the first half in its data network and speed performance, especially in major metro areas. T-Mobile’s median download speed was on par with Verizon in terms of being the fastest, and was faster on uploads, Moore said, though Verizon had more consistently high speeds. T-Mobile’s deployment of 15×15 MHz LTE networks in 26 metro areas by the end of 2014 likely was a factor in boosting its speed ratings since wider spectrum channels allow for faster speeds. Moore noted that although Sprint had some data and speed improvements, it is “important to point out Sprint had the slowest network” overall among the four Tier 1 carriers. RootMetrics’ overall performance scoring is broken down in two ways. First, RootMetrics offers two holistic indices that give consumers a clear view of each network’s performance in terms of network reliability and network speed. The firm’s Reliability Index is based on how reliably calls could be made and texts delivered, as well as how often RootMetrics could make a data network connection and then stay connected throughout testing of all performance categories. The company’s Speed Index includes how quickly a network could download and upload files, send emails, perform typical web and app-related tasks, and send/receive texts. Overall scoring is also broken down into call, data, and text RootScores. The firm says that looking at the network reliability and speed indices in conjunction with overall RootScores offers “the most comprehensive look at a typical mobile experience” on the carriers’ networks. Moore noted that the best apples-to-apples comparison between the firm’s first-half report and its second-half report is to look at how many awards each carrier got in the six categories RootMetrics tests for. By that measure, Sprint saw the most improvement, especially in terms of reliability (going from just three awards to 28), call performance (17 awards up to 24) and texting performance (17 awards up 41). Moore added that another way to measure the progress carriers are making is to look at how many awards in the 125 metro areas the companies received for outright wins or ties in the six categories. That shows how carriers performed in areas where 60 percent of the U.S. population lives. 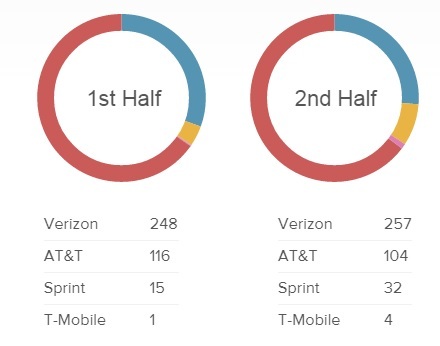 Verizon actually slipped from 542 awards in metro areas in the first half to 537 in the second half. AT&T saw its metro award tally drop from 437 to 388. However, T-Mobile gained in this respect, grabbing 201 metro awards in the second half compared to 169 in the first half. Sprint saw the biggest improvement though, nabbing 135 metro awards in the second half compared to just 27 in the first half. RootMetrics’ numbers showed how the carriers performed in outright wins and first place ties in the first half of last year versus the second half. In an interview with FierceWireless, Sprint CTO Stephen Bye said that in the first half of 2014 Sprint was in the process of finishing up its Network Vision network modernization program, which involved ripping and replacing its entire 3G CDMA network as well as adding LTE, which degraded performance for a while before improving. After that, he said, the company focused on optimizing its network in terms of 800 MHz and 1900 MHz voice services to reduce blocked calls. The carrier recently rolled out 800 MHz voice nationwide, which improved call performance and inbuilding penetration. “Getting the reliability of voice was important,” Bye said. Bye acknowledged that Sprint still has a lot of work to do to improve its data performance and speeds. Part of that will come through the company’s plan to finish deploying 800 MHz LTE services nationwide. The company is also going to push to expand its 2.5 GHz TD-LTE service, which covered 100 million POPs by the end of 2014 and now covers 125 million POPs. “We’re very encouraged by the improvements we’ve made, but it’s not over,” Bye said.